The June Canyon is the new low cost NUC. NUC7CJYH (Celeron J4005, 2.7GHz dual-core, 10W) and NUC7PJYH (Pentium J5005, 2.8GHz quad-core, 10W) both feature 2 HDMI 2.0a ports, 2xDDR4L-2400 memory slots (max. 8GB) and an M2.SSD slot and an SDXC slot. The Celeron model will be available first and should be coming before the end of the year and the Pentium version will be released in January. Hades Canyon will be something different. It’s coming in two versions (NUCxi7HNK and NUCxi7HVK where x is probably 8) where the other one is dubbed as Hades Canyon VR. Quad core Intel Kaby Lake-H CPUs with a TDP of 65W (non-VR) or 100W (VR version). The roadmap also states dGFX for discrete graphics! That might explain the high TDP mentioned, as the Kaby Lake-H CPUs only have TDPs between 25 and 45 watts. The form factor will likely be all new and both NUCs feature double M.2 SSD slots and double Thunderbolt 3 ports supporting a maximum of 6 displays. It looks like we can expect the Hades Canyon to be available in the Spring around Q2. The Bean Canyon is probably the least surprising of the bunch. It’s the core i3, i5 and i7 NUC of 2018. It will replace the Baby Canyon NUC (Kaby Lake) and the specifications look very similar to the previous generation. 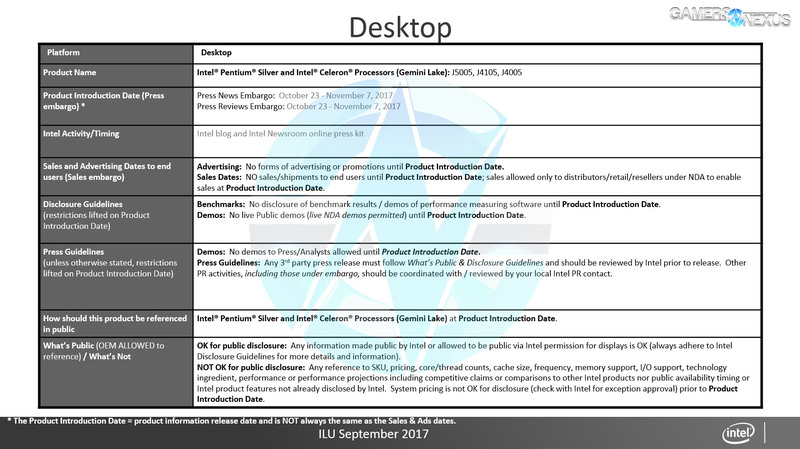 Of course the Kaby Lake SoC has been replaced with the Coffee Lake-U SoC. The HDMI port is now of 2.0a variety and the TDP of all of these has been pushed up to 28W. Available on the second half of 2018. Models are called NUC8i3BEH/K, NUC8i5BEH/K and NUC8i7BEH/K. Proper HDMI 2.0a for June Canyon? Or still the display port shenanigans of the Kaby Lake NUCs? “Native HDMI 2.0”, or so they say for now. Pictures is very low quality. Pictures *are* very low quality. Pictures are *of* very low quality. Pictures as of *a* very low quality. I did cancel this one… oh well. Pictures are of *a* very low quality. “The” pictures are of a very low quality. Let’s hope these will be able to properly display 4K at 60 hz. The current NUCs have massive problems with this; there is a huge thread over at Intel’s support forums. @jon Many of the issues on the Intel forums that you are referring to have been resolved. I have a Skull Canyon and I’m currently driving 2 4K monitors at the same time. One Vizio @60Hz and the other a Dell at @30Hz (monitor doesn’t support 60Hz). Also note, my screens are stable. There were complaints on the forums about screen synchronization issues, vertical lines, and other glitches. I did have to do some configuration steps out-of-the box including updating the BIOS. But these one-time annoyances were a small price to pay for finally getting such an awesome setup. Also, while you don’t need the ridiculously priced HDMI cables, I have found the $3 cables prevent the TV/monitor from synching up when running [email protected] I’m now using a $10 cable. Gemini Lake launches on Nov 7th or 8th. Would it make sense buying the Intel NUC6CAYH or should I wait for the NUC7CJYH? If you’re really just looking for a 4K video player, this is a difficult question. I have the 1st Gen Shield and a NUC6CAYH. The Shield had a very very defective variant of the Android OS prior to the release of the 2nd Gen model, when they released “SHIELD Experience Update 5.0.” There were audio output problems, networking problems and the list goes on. For a product that came out in May 2015, it was an aggravating experience to have software that finally made the device work properly released in February 2017. My NUC6CAYH, meanwhile, is running LibreELEC 8.2 and Windows 10 Pro. 99% of the time I leave LibreELEC running. It’s solid to the point that I let it act as a “server,” with a 4TB external HDD holding my video files. There is not really as much to say about the NUC because it hasn’t been nearly as problematic. I do have 8GB RAM (the max) in the NUC. The Shield only has 3GB of RAM, but has a MUCH more powerful processor than the NUC6CAYH. To be honest, if I were in your shoes, I’d buy the Apple TV 4K, and run the wonderful video app “Infuse” – http://www.firecore.com – I love my Apple TV 4K. It also has an insanely powerful processor, but only 3GB RAM. Seems to do fine with 3GB though. Hi Alex. Regarding an apple TV with firecore. Where do you store your media, since the Apple TV only has 64Gb? I have a 4TB USB 3.0 external HDD plugged into my NUC, running LibreELEC (Kodi-based Linux distribution). Call it a poor man’s NAS. The SMB settings on LibreELEC are wide open – easiest network share scenario I’ve ever dealt with, but it’s just inside my home network. I back up manually right now. Infuse will connect for sure via SMB, SFTP (SSH), and UPnP – I assume NFS, and I could be missing more…it picks up my LibreELEC SMB share in a quick scan of the network! Downside – NUC stays on all the time. NAS device to the rescue soon. Gemini Lake delayed, and so maybe NUCs. Possible very good news for NUC7CJYH (J4005) and NUC7PJYH (J5005), it seem like Gemini Lake processors (atleast N4100 so far, check link) will use UHD 6xx graphics, instead of old HD 5xx graphics from Apollo Lake. I’ve expected a generational bump due to VP9 10-bit decoding which has been announced for Gemini Lake and is not supported by Apollo Lake (and of course is supported by Kaby Lake that has the 600-series GPU). Ha I came here again today looking for the same thing as you. Do we have any confirmation that the June Canyon/Gemini Lake NUCs will have a M.2 2280 SSD slot? The roadmap says so, but it also says that the Arch Canyon/Apollo Lake NUC had it, which is not correct. Hello anyone seen these nucs out in UK yet ? maybe even pre-orders..
know surfing the web , youtube, email and if im lucky maybe even a Vm. Would this nuc be able to Vm 2 or 3 windows 7 and use it for basic desktop use? i want to buy a an i3 mini-pc for quiet operation and all-around use, but mainly really heavy browsing (hundreds of open tabs). I was going to wait for the the BOXNUC8i3BEH2 NUC but seeing the consumption has been increased to 28W, I am skeptical whether it is worth waiting. As far as I know, the NUC7i3BNH is quiet enough in operation and powerful enough to fit the bill. Should I wait for the new release? Which of these support the SGX2 instruction set?